Image Size 26 x 29 in. Ron Benner born in London, Ontario on Jan. 8, 1949. Independent visual artist and social justice activist since 1971. Attended the University of Guelph in 1969/70 and is a survivor of agricultural engineering. Worked for the Norfolk and Western Railroad from 1970 to 1979. Member of Forest City Gallery 1975 to 1982. Co-founder of the Embassy Cultural House, London, Ontario 1983 to 1990. Photographic/garden installations presently located at Museum London and Wilfrid Laurier University. Recently completed a site-specific installation at the Visual Arts Centre of Clarington, Bomanville, Ontario which is located in a former barley mill. Public exhibitions across Canada and internationally including Salamanca, Spain, Xian and Beijing, China, Mexico City, Mexico and Havana. Cuba. 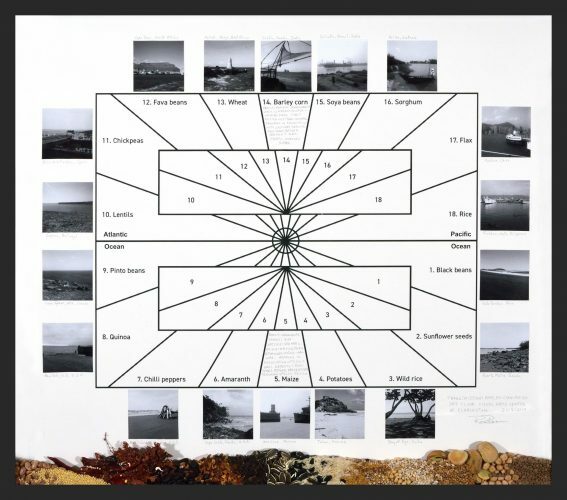 His installations are in the collections of the National Gallery of Canada, Ottawa, the Art Gallery of Ontario, Museum London, London, On., Art Museum University of Toronto, Toronto, On., and the Casa de Las Americas, Havana, Cuba. Trans/mission: Barley-Corn-Maize is a work study for a mixed media photographic installation presently installed in the Visual Art Centre of Clarington, Bomanville, Ontario. The Centre is located in a former barley mill. The photographs were taken between 1981 and 2004. Curated by Sandy Saad.